Cosmoholic is for people who are passionate about make up. We create luxurious and innovative products for professionals and make-up artisans. The beginnings of innovation and creativity starts in 1930 when a special box was made for a 12 year boy to cut hair at his father’s barber shop during the great depression. Perhaps it was stepping up on to that platform for the first time that inspired my grandfather’s lifelong passion for innovation and creativity in both cosmetics and professional hair industries. 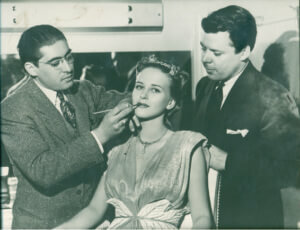 Apprenticing with Ern Westmore at the House Of Westmore in Hollywood, he learned to create application technique and cosmetic formulations for the big screen. He worked in glamour and also constructed facial features for actors and actresses in character roles. James would later develop and patent many inventions. His first was a process to manufacture false eyelashes “ShowLash,” and his last was the invention of the very first UV Gel system for artificial Nails. Although he was proud of all his achievements makeup held a special place in his heart. 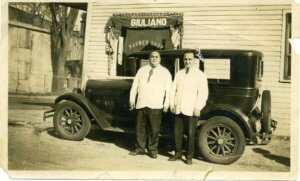 As an early pioneer James would custom blend lipsticks and rouge while you wait, in the department stores – “Giuliano Blends.” It is this small batch detail that is core to the Cosmoholic brand. And we hope that our products will feel that we made them. Just for you. From mixology to cosmetology. By day I was my grandfathers apprentice learning everything I possibly could about beauty, manufacturing and of course, food.By night I bartended, embraced and survived the Boston night life all the while starting the business that it has become today. I was fortunate to be surrounded by a family of engineers and artists, these were strong influence on my approach and desire to create. It was by some strange twist of fate or dumb luck that Melissa came to be the accidental mixologist. It did not take long for us to see that we shared the same passions for both beauty and each other. We took the leap together in both business and marriage. Melissa is involved in every aspect of Cosmoholic, from packaging to PR. She is a driving force and inspiration to pursue our dreams and the ones first inspired by my Grandfather. We have been so fortunate to bring on board a staff that is equally passionate about Cosmoholic, and it shows. A special thank you to Anton “MadScientist”, Ashley “Ace” and Kat “Perfectionist” – for your dedication and skills that set us apart from the rest!